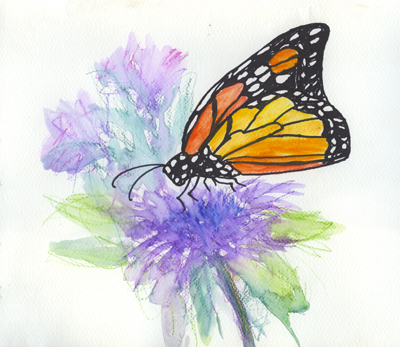 Plant Milkweed to Save the Monarchs! Obtaining seeds - here is a link I found for seeds currently available for sale. You can also get Showy Milkweed for California, OR, WA, ID, NV, UT regions. Larner Seeds has narrow leaf milkweed seeds along with many great Cal native seeds. Theodore Payne carries the narrow leaf milkweed and several more unusual varieties of native milkweed. Michelle says "Annie's Annuals in Richmond has starts. According to CA law, they treat their starts with BT which kills caterpillars in its 1st year or so but at least there would be milkweed in the ground for the following year. All nurseries in CA are like that and I do think it is better than nothing. Calif monarch situation not as urgent so if people planted milkweed this year, it would spread and offer a larger patch for next year." If you are planting in the spring, here is a Handout. You need to grow them until three inches tall before putting in the ground. In the fall, the seeds can be put right into the ground. Artwork by Julie Newdoll www.brushwithscience.com copyright 2015. TIME TO PLANT YOUR MILKWEED SEEDS! Fall is when you can put them directly in the ground. The Monarch butterflies can ONLY lay their eggs on Milkweed, and it is dissapearing due to pesticides and farming practices. YOUR 4-H group, Scout troop, or any willing person can plant Milkweed to get a butterfly icon on the map below. Send us the location and the name you would like dedicated to your butterfly icon and it will be posted on this page in the "Milkweed Log" below. When your milkweed grows, if you take a picture and send it to us, we will post it below in our "Milkweed Rag", along with any story you have to tell about your experience. Consider sending other groups a packet of seeds and a letter asking them to plant Milkweed, too! Many groups, such as the 4-H, have lists online. See the Milkweed Rag below for a log and pictures of the planters. ALERT - Many nurseries, such as Home Depot and Lowe's sell toxic "butterfly and bee friendly" plants. Ask and don't buy them if they are or they don't know. Lets try to cover up this map with butterflies. Goal: one million plants! National Atlas of the United States and Mexico (public domain). This map shows where people or groups have planted milkweed. Send me your location if you plant milkweed and you will get a butterfly on the map! Also send pictures and stories if you like for the Milkweed Rag below! People are starting to think spring and butterflies! I just heard from someone in Portola Valley who has a whole flat of milkweed and will be sharing them with friends. It is better to plant plants in the spring and seeds in the fall, so moisten your seeds overnight, put your seeds in a pot and let them grow three inches before planting. Michelle of San Mateo County, after all her efforts growing seedlings in her greenhouse and planting milkweed in her garden, spotted a monarch on one of her plants! Informed by the San Bruno 4-H that Belle Air Elementary School in San Bruno planted Milkweed. Thank you! 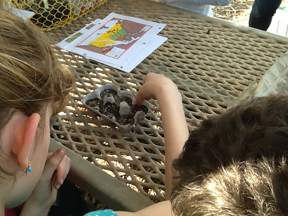 April 30, 2014, our Daisy Girl Scout Troop in San Carlos transplanted 22 Narrow-Leaf Milkweed seedlings into small pots. Each Scout took her plant home to grow larger and then plant in her yard. The Troop members live in San Carlos, CA. Our neighbor Michelle provided the seedlings which she had grown, a couple packets of Milkweed seeds, and flyers about how to grow Milkweed for Monarchs. 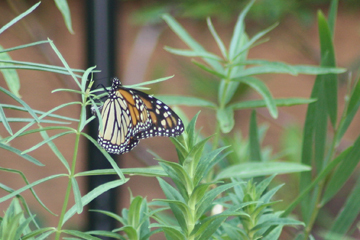 On May 2, 2014, Anne planted 15 Narrow-Leaf Milkweed seedlings in her backyard to create a Butterfly Garden. My Daisy GS and I are growing her potted seedling and several others to a larger size before transplanting to our garden. San Bruno 4-H had a milkweed planting session. They have a great group! They placed seeds that had been moistened in paper towels overnight into egg cartons filled with potting soil. 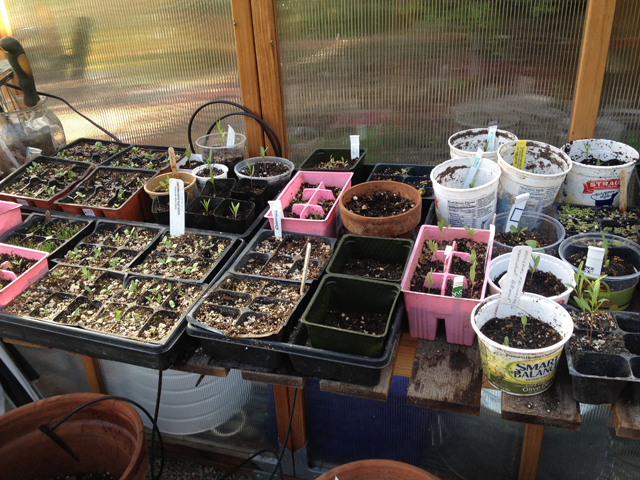 Michelle of San Mateo County reported planting lots of seeds and has six full grown milkweed plants! She also visited a local 4-H group in San Bruno and gave them a Milkweed planting demonstration. Thanks, Michelle! 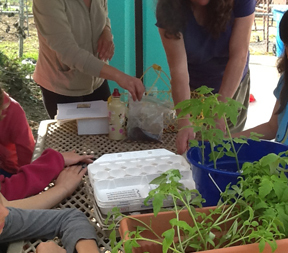 Karen of San Carlos took several packets of seeds from our project for her Girl Scout Troop. We look forward to your pictures, Karen! email julie@brushwithscience.com with the location (city) you planted your Milkweed plants, how many, and any identification of yourself or your group you would like to supply. We will list this here and put a butterfly on the map in your general location. 1 - 6. Michelle - San Mateo County, California. 7-14. San Bruno 4H group. 15-20. San Carlos Home School Group. 21-31. San Carlos Girl Scout Troup. 32- 42. Belle Air Elementary school in San Bruno. 43-63. Daisy Girl Scout Troop San Carlos, California. 64-79. Anne of San Carlos, 15 Narrow- Leaf.